Autumn is coming – Time for reflection…Oh, and clearing the garden. A few days ago I decided (on the spur of the moment), to take down a Magnolia tree that was shading the house. To be frank, the real reason is that it was giving the local squirrel population a convenient bridge to my roof space and therefore extending my ongoing battle with there smart little beggars! However, the point of this reflective post is that I did EXACTLY the opposite of the advice I give to my patients! With frowning solemnity, I tell them how silly it would be to treat ANY physical activity differently to the way that we should approach exercise and movement. This of course includes gardening, especially the , “I was only moving a large pot/I was only felling a tree/I was only double-digging the potato plot ready for next season”, comments that I smugly listen to and gently shake my head sadly at. I made the decision (good, as I had been putting it off for a while), leapt to my feet and gathered the tools I’d need (pretty good, as this shows planning and commitment), fired up the chainsaw and plunged in (really not so good, as I’d done no physical preparation and hadn’t got proper eye protection), and then spent several hours turning a perfectly good tree into fuel for the open fire and a huge pile of debris that I couldn’t be bothered to take to the dump because my back hurt, my shoulders were knackered and my quads were shaking from spending too much time terrified up a ladder! What lesson should I draw from this? The most practical answer to that is probably go to work and earn the money to employ a professional (but then would he arm up either?). What should I and you and, indeed a professional tree surgeon, have done? IS KETTLEBELL GOOD FOR YOUR BACK & SHOULDERS? 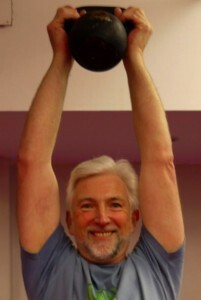 First, I am a Registered Osteopath and must state that my interest in this opinion piece is for the relevance of Kettlebell for people who already have back problems and more specifically for the chronic or long term sufferers. Also, this is quite a long rant, but please bear with me because the general issue of how we tackle chronic back pain in this country is a serious one and often badly tackled. Anyone with an acute back problem should avoid strenuous exercise until they have been properly assessed by a Registered Osteopath, physiotherapist or appropriate medical practitioner. Second, you may well ask, what on earth is Kettlebell? This dynamic exercise and training form is currently making itself felt throughout the fitness industry and claims the patronage of many celebrities, (Jennifer Lopez, Matthew McConaughey, Gerri Halliwell and Penelope Cruz are often mentioned), Russian Special Forces, boxers, cross-fit trainers, MMA* fighters and football clubs. Raging through the US for the last decade with crossfit trainers and fitness adherents, the discipline has been in the UK for the last few years and it has now reached a prominence that is hard to ignore. Its origins are not entirely clear but lifting weights to improve strength and fitness goes back as long as boys have wanted to show off . Kettlebells have been claimed by the Russians, Turks and Scots, (who apparently trained with small church bells!). The kettlebell or Girya resembles a cannonball with a handle. Incidentally, they do not ring. The only sound created is the heavy breathing of the user and the occasional clang as the bell finds the floor early! Weights vary from 4Kg to 60kg, although typically 8kg, 12kg, 16kg and 20kg are used by normal mortals. The more capable and ambitious ‘kettlebellers’ are called Gireviks, Russian for weightlifter. Now, it is not my business to promote Kettlebell as a practise, there are plenty of more able people out there who can do that, but must declare that I am an enthusiastic participant who has benefited, and has done so at a number of levels. A good whole body mobilisation is essential. Some moderate aerobic exercise such as jogging, star jumps, squats and arm swinging, shoulder, neck and quads stretches take place over several minutes. Now I know that the evidence for stretching before exercise is now felt not to help in preventing injury, but you will need 6-10 minutes of cardiovascular ‘warm-up’ for the session that follows. For the chronic back pain sufferer, I think this gives hope. All too often, rehab programmes concentrate on passive stretching and mobilisation, rather than a return to CV health and strength. Personal and professional experience tells me that someone with a 20 year history of back pain is afraid of the consequences. The attitude is ‘better the devil we know’ and all that. Maintaining the staus quo is better, in the minds of many, than ‘stirring things up’, which is often the experience they have starting a new exercise programme. It takes a lot of courage to start a regime knowing that it may well make things feel worse to begin with. However,the important word there is FEEL. I spend much of my clinical time agreeing with patients when they say, “but won’t that exercise make it hurt more?”. They don’t expect me to agree, because previous advice will often have been about caution and ‘don’t do too much’. Being frank about what will happen is often more to do with the therapist making their own life easier; management of the patient rather than management of the condition. Both are needed, but it’s the emphasis that may need looking at! Please remember, hurting more does not necessarily equate to damage! Of course, there are risks, but with proper guidance from your Osteopath, Physiotherapist or health advisor and in conjunction with your trainer, doing damage or causing any permanent worsening of symptoms is unlikely. The trick is to take the right amount of time for the individual and this is where group classes can be weak – frankly, even the best trainers can’t be expected to tailor programmes for each person in a class of 20+. Don’t blame the class leader though, take personal control and think of how you get around the issue. So, what is the answer? Well, one answer is to take personal tuition to begin with. Yes it can be expensive, but at say £35 to £40 per session over say 4 weeks, it’s cheaper than an overnight stay in London. Put bluntly, I know plenty of my chronic back pain patients do that fairly regularly ‘as a treat’. So treat yourself to being well and it may improve your mood and mental well being as well – radical stuff, eh? Probably sounds smug, but it’s what I did. I took a couple of 1-1 lessons and was joined by a friend for a further 2, (price went down for 2 by the way), then another friend for two last sessions. Then I felt ready to join a group class. Let’s face it, most blokes don’t want to look like they don’t know what they are doing and most women don’t like to be stared at!! No doubt that sounds somehow sexist, but I hope you know what I am getting at. The basic form is the TWO HANDED KETTLEBELL SWING. I won’t describe each exercise in detail, but the kettlebell swing is where it all starts and the technique must be good to both protect your back and get the most out of the exercise. The swing mainly targets the legs and abdominal muscles, the back, (BUT NOT WHILE BENT),the hip rotators and increases cardiovascular endurance. The swing element comes from contact with the inner arm as it meets the inner thigh and the thrust generated by a crisp forward thrust of the hips/pelvis. The aerobic nature of the exercise is what startled me most when I started. The next technique to master is the CLEAN. The kettlebell design allows for the weight to roll around the hand and wrist as you lift into the clean, keeping it balanced and ‘close packed’. Once again, the power is coming from the thighs, abdomen and to some extent the lower back, dynamic, fluid and using the whole body to distribute any stresses. However, you can see that the back is held in a neutral or slightly extended position. The lifting arm is held close to the body to protect the joints in the arm and shoulder. This is crucial, as injuries to the rotator cuff are common when weights are used with the arms extended or stretched out. The loose arm is used for balance and seems to help focus the dynamic nature of the move. The next move is a continuation of the CLEAN; the PRESS can be seen in the image here. Particularly good for shoulder, shoulder blade and upper back muscles, it is once again using the whole body, flowing from one structure to another and while the joints are used throughout their range. There are few static moments during kettlebell moves, the time when soft and bony structures are most stressed, and so helps in reducing the risk of damage. While excellent for promoting mobility in the joints at each end of the collar bone, the upper ribs and neck, this exercise needs to be done with good technique. This often means using an approriate weight. I have seen people struggling with too much weight, the technique suffers with the consequent risk of neck strain. I should also say that the leaders of the class that I attend are very hot on this and encourage swapping weights during a set – the emphasis is on keeping going safely rather than emulating Atlas. The static presses and exertions of ‘regular’ gym weights, fixed or free, do, in my view, carry the risk of overextension of the joints and point pressure on vulnerable structures such as the rotator cuff insertion, acromio-claviclular joint, knee and shoulder cartilages. There are plenty of other basic forms, but check those out on the kettlebell sites, (see examples below), as there are variations and styles that should suit most needs. So, after all that, is it good for your back? Please remember that the back, (or spine), to physical therapists also includes the neck. Succinctly, if you are well but unfit and want to become so, then yes. If you have back problems, then proceed with some caution! However, as with all exercise forms, make sure that you seek out well qualified trainers and yet be strong enough in yourself to proceed at your own pace. Their job, in my view, is to provide the knowledge, support and skills, plus the encouragement to keep going and to draw out your motivation. In conclusion, I like this regime because it is dynamic, relatively low impact and uses the joints through their whole range. It flows, is as much about balance and technique as it is about strength, yet improves power. Kettlebell is an excellent mix of aerobic exercise and fat-burning, with muscle toning that doesn’t produce too much bulk. It is egalitarian and friendly. My experience is that the men and women who go are not there just to look wonderful, but to improve themselves generally. Sounds a bit twee, but I mean it. Posers are at an absolute minimum and overt testosterone is low. There is a good mix of abilities, ages and, lets say, weight categories and there is an old-fashioned helpfulness, at least in the class I attend. Go on, give it a go. As previously stated, check with someone qualified to judge but you may well be suprised by how much you will benefit! Training in the Brighton, East & West Sussex area. Bored With Shoulder Articles? How about Christmas Pains? Just lately I have put up several shoulder related articles – I’m sure that this is getting boring, so what else has been coming into the Adur Clinic lately? Seasonality is something of a fact in Osteopathy and Physiotherapy clinics and some of the trends are probably no surprise; Spring tends to bring in the gardeners and sports people. Summer time sees more sports problems, especially football, water sports and cycling, while in Autumn there are more falls as the ground gets wetter, softer or more icy. The pre-Christmas season also brings us some specific strains and injuries. The present-shopping melee’s that have to be endured lead to an increase in back and shoulder strains from carrying awkward shapes and loads. The horror of the food shop, with massively overloaded trolleys, sometimes two, with sticky wheels just adds to the musculo-skeletal misery. The only advice I can really give is SLOW DOWN. I can almost hear the moans – ‘what is he talking about, I haven’t got the time to slow down…far to much to do and if I don’t, no one else will’. Sadly, I do hear this all the time and, while I am sympathetic to the problems, taking things less frenetically is the only realistic answer. Imagine the scene – on your knees, twisting to reach the furthest away item, turning the other way to get the paper off the roll, sellotape pieces stuck to your hand, youngest child begging to be let in the room, or wanting a wee and the dog walking through the whole lot! It does take longer, but wrap at a table or better a kitchen worktop which is at a better height. Less twisting = fewer back problems. Simple, really. Now, wrapping over, the big day comes and the bend to put the bird in the oven, (often after a few the night before), and the back ‘goes’. The number of times I have heard this and another Christmas is ruined is not quite countless, but it is very familiar. Do the sensible thing and get someone else to do it for you. Failing that, bend at the knee with a straight or slightly extended lower back and DO NOT TWIST! Assuming you survive Christmas the next thing is to survive the urge to go to the gym to burn it all off. Just a word to the wise – the gyms will be packed at first, but this settles back to normal in about six weeks when all the good intentions have faded away and other people have forgotten the rash resolutions you publicly announced. Make your resolution to start at a time that is ‘offbeat’. You don’t have to follow the crowd and if it is your decision made on your terms, you are more likely to stick to it, in my view. Also take your time to decide which exercise suits you; swimming is a great all round exercise, but if you find it dull and a chore, you won’t keep it up which is a waste of membership fees and achieves very little. Experiment and try and find the exercise that you enjoy – it doesn’t have to be a sport in the conventional sense. What about dancing, walking and cycling? The thing that matters is to avoid injury in the first place and to keep fit in a way that gives you pleasure. You just have to get out and try a few different things to find which suits best.